Make this beautiful terrine a day or two in advance and allow an hour of prep time to prepare all the citrus. It’s an elegant first course or brunch dessert. Adapted from Fine Cooking. Have ready a 9 x 5-inch Pyrex or ceramic loaf pan and make room in the fridge. Cut off the ends of the grapefruits and oranges. Position the fruit on one end and cut away all the zest and pith, following the fruits’ contours. Holding the fruit in one hand over a large bowl, cut along the membranes to release the sections into the bowl. Squeeze the juice from the membranes into a 2-cup measure. Add any collected juice from the sections. You should have about ¾ C citrus juice. Pour the citrus juice into a small, heatproof measuring cup or bowl and sprinkle the gelatin on top. Let sit until the gelatin is moist, about 3 minutes. Microwave until the gelatin is dissolved and the liquid is clear, about 30 to 90 seconds. Add to the 1 C orange juice and set aside to cool slightly, stirring occasionally. 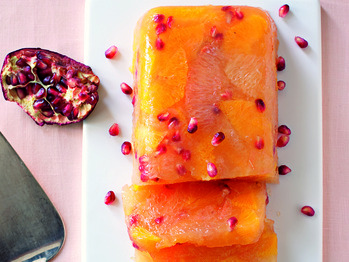 Add the pomegranate seeds to the citrus sections and gently toss to combine. Pile the mixture evenly into the loaf pan, leaving behind any extra juices. Slowly pour the warm (not hot) gelatin liquid over the sections. Tap the loaf pan gently on the counter to release any air bubbles. Refrigerate until the top is set and then cover with plastic wrap. Refrigerate until firm, about 6 hours, or for up to 2 days. To serve, run a small knife between the gelatin and the loaf pan and dip the bottom of the pan into warm water for about 1 minute. Quickly invert onto a flat serving plate and shake gently to loosen the terrine. Cut into 1-inch slices. This entry was posted in Appetizers, Brunch, Desserts, Recipes, Recipes from Adrienne's pantry, Salads, Sides, Vegetarian. Bookmark the permalink.